When Phil and Yvonne Dorn faced their new build project, they knew what they didn’t want. They felt that many modern homes were too big, lacked character, were too minimalist and didn’t fit with the environment. By blending the beauty of timber and a palette of soothing Resene colours, they now have a home that looks sensational but also ticks several eco boxes without sacrificing comfort. The house also won a regional Registered Master Builders award for Mark Waller of Waller Projects Ltd.
What Resene colours and products did you choose, and why? We chose colours that felt calm and soothing and were inspired by the outdoor views, the paddocks and the sea. We wanted a ‘non-clinical’ white in the majority of the house to create a light, roomy, airy feel. Resene Half Sea Fog was the answer and the bedrooms are in soft greens and blues: Resene Crisp Green and Resene Robin Egg Blue. We wanted timber to be a feature of the interior, so that is finished in Resene Aquaclear. We both felt that a lot of modern buildings were too white and clinical we wanted something that combined a Scandinavian feel (Yvonne is Danish) with the warming elements of wood. Somewhere people would come into and immediately feel comfortable and somewhere we could use to reflect our personalities. Hard to say. We love the ensuite which is a bit of luxury, but the living and kitchen space, which has views out to Ambury Farm, is hard to beat. The recycled rimu 1970s-style bookshelves are a real triumph. Take your time, listen to others’ advice but don’t necessarily take it. Have confidence in yourselves and your decisions. Think a lot about how you like to live, what’s important to you. Tell us about the eco features. The house is smaller than the average new home. It has a passive solar design with north-facing windows to catch the sun and a polished concrete floor to provide thermal mass, absorb the winter sun and maintain a good temperature. We have a rainwater collection system, solar panels, heaps of insulation, only one south-side window and double glazing on all doors and windows. Budget, and the inevitable tradeoffs that are made. Building is expensive. 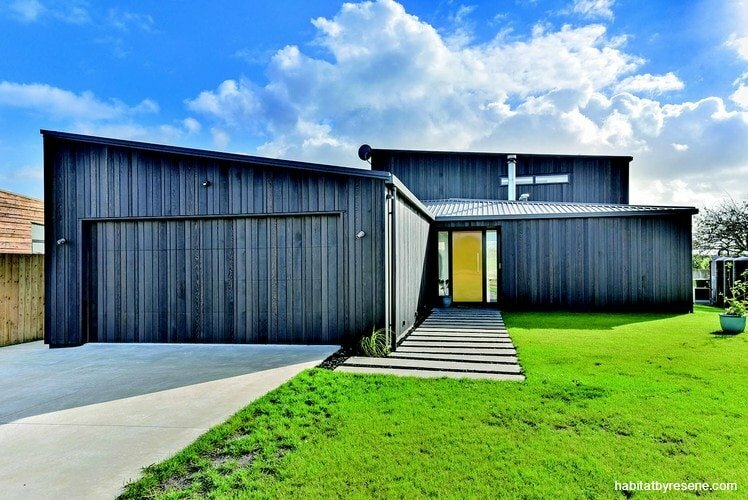 We had an original wish to have the exterior clad in burnt wood – shou sugi ban. But this proved too hard to do so we used Wood-X Foundry available from Resene ColorShops. The house also sits on a lava bed so punching down for foundations is difficult. Did anyone else help with the project? Apart from Mark Waller who was enthusiastic and calm and made the whole process much less stressful than we thought it would be, there was Matt Laird from The Drawing Office and Peta Davy from Yellowfox who introduced us to some great products. Also Johnny the builder who put up with us popping in and asking lots of questions. did you know… that Resene Concrete Wax is a perfect finish for concrete floors? It’s a tough waterborne satin glaze that is quick and easy to apply. It’s non-yellowing, resistant to chipping, peeling and oil and fat splashes. Wood-X Foundry stain available from Resene ColorShops gave Phil and Yvonne the charred black look they were after for the exterior. The front door is powdercoated but you could get this cheerful look by painting with Resene Wild Thing. Natural and stained timber (in Wood-X Foundry stain available from Resene ColorShops) look superb together in the sheltered outdoor living space. Resene Half Sea Fog (using Resene Enamacryl and Resene SpaceCote Low Sheen) was chosen as the perfect ‘non-clinical’ white and used for the living room walls, doors, ceilings and skirting. Phil and Yvonne are particularly pleased with the retro shelving unit. Timber was chosen as an feature, used on cabinetry and the cedar stair screen, and finished in Resene Aquaclear. Taking inspiration from the neighbouring farm reserve, the spare bedroom was painted in Resene Crisp Green. A second living and office space is painted in Resene Robin Egg Blue.